This last week a few stag beetles have been spotted in and around the wood. Stag beetles are Britain’s largest terrestrial beetle and though they used to be pretty widespread throughout Western Europe, their numbers are on the decline. They are now so rare that they have been given “protected species” status on Schedule 5 of the Wildlife and Countryside Act 1981. If you see one in the park and it looks as if it could get squashed, please move it *gently* to a safer place out of harms way. NOTE: female stag beetles can give you a nasty nip so be careful! 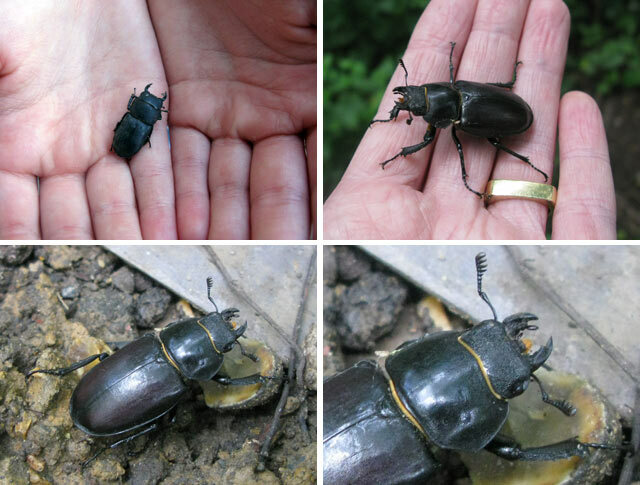 Please also record your sighting on the London Wildlife Trust’s stag beetle database. You’re not the first person to say that! When i found the large female, a couple of workers from Sainsburys came and had a look and said the same thing. I hope they make a come-back.